Club Penguin Cheats by Mimo777 Club Penguin Cheats by Mimo777: Mimo's Caption Contest Finalists...Finally! Me Santa: I wish a had brought my camera. Mimo: WHAAAAAAAAAAAAAAAAAAT? That was the whole point of me doing this! WHY ME? Mimo : Is it just me, or is that bubbles i see coming from Klutzy's direction ? Me Santa: I have a feeling you won't like the smell of Klutzy's bubbles . Me Santa: Mimo what are you doing? Me Santa: Watcha doing up there Mimo? Me Santa: Hey, you know your gonna have to come out at some point. Penguins need to breathe too! Mimo: "Merry Christmas!Wait who are you? Me Santa: "Duh! It's me santa! Mimo: Hehe! This feels funny! Me Santa: OH NO! Mimo, we need to get you to the hospital! You spelled funny the right way! What has that crab done to you!? Me santa: YOU CAN DO THAT FROM THE SIDE OF THE GLASS THAT ISN'T IN THE OCEAN THOUGH! Mimo:...I didn't think thiss one through. Me Santa: What are you doing up there Mimo? Mimo: Trying to see if Klutzy smells 'funny'! Mimo: Uhh Me Santa, I Forgot To Get My Goggles, Can You Get Them For Me? Me Santa: :O :O Who Was That?? ZOMG A Talking Crab! Wait Till I Tell Mimo! mimo: hello. wait-why r u upside down? me santa: u r upside down! klutzy: I hate it when they fight. Mimo: Gah! Me Santa get me down from here! Me Santa: Say "cheese"! This is so going on our next Christmas card! Mimo: It's a parallel dimension out here! The crab must be the portal to this whole new world! Mimo: Brrr... The waters freezing! Me Santa: Mimo you'r in Antarctica! What do you expect?!? Me Santa: Whys the Water Yellow? Me Santa: The Crab did wat? Hey cool mines in there. Cool. Finally. Congrats to everyone who made it up there. Hey, is it against the rules to vote for more than one? lol. All of them are pure funnyness. I voted for number 5 tho. :D wewt! i just love number 5 its the funnyest one there and they were all funny! Wow, I think number 5 was pretty funny! 14. it made me rofl. Sorry I haven't been able to mod for a while, Mimo. My computer needed to get fixed because someone hacked it. But it's working again now. One again, I'm sorry. Yours was cool. I voted for yours. Great work to all the contestants. They were all really good. I voted for #12. That one was good. But great work everyone else aswell. OMG! I won! Thank you thank you! I loved all of yours! I hope i win. mine was number 7! 7 7 7 7 7 7 7 7 7 7 7! Vote for #7! I Couldn't really pick which one! If i had 15 mouses, i would click on every bubble then click vote! i hope mimo forgives u...sounds like you've tried really hard...i hope im a mod soon! I hought that number 6 was hilarious. I wasn't keen on number 5 though, I mean, it just wasn't funny. Congrats! I personally like number 3 and number 5. Ha ha ha! I like number 15! MINES UP THERE!!!!! WOW WOW WOW! THANKS MIMO! I uh voted for a you. Great, funny entries people! I don't really get #5 much. Guys, congratulations to everyone who else who mdae it as a finalist. the chances were 15 out of 1059 to be up there so way to go! omggg haha 6 is HILRIOUS!!! Honestly, i don't think there very funny. there okay, but thats it. I saw some in the comments that were good, but none of them were on there. I'll see if i can get a name later. yay that was mines! Thanks!!! Duh! It´s me santa! ROFL. Lol. 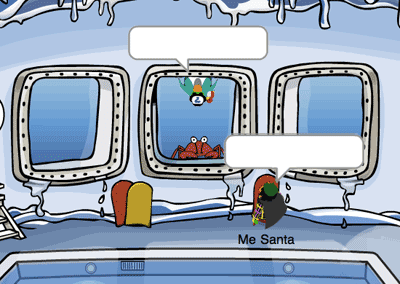 I like the one where Me Santa goes like "What did the crab done to you?"lol. My answer was too long.